News reports from Russia and Europe cite a statement by Roskosmos this week that the launch will be postponed in order to carry out work to increase the reliability of the satellites. 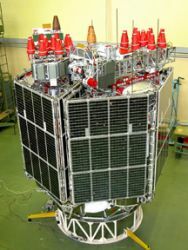 The troubled on-orbit satellite — GLONASS #726 — was launched September 25, 2008, and began transmitting on GLONASS RF channel -3 last November 13, 2008. The problem with the signal generator was detected in late in August and the spacecraft taken out of service on August 31. It remains uncertain whether the problem will affect the scheduled December 25 launch of three GLONASS-Ms.